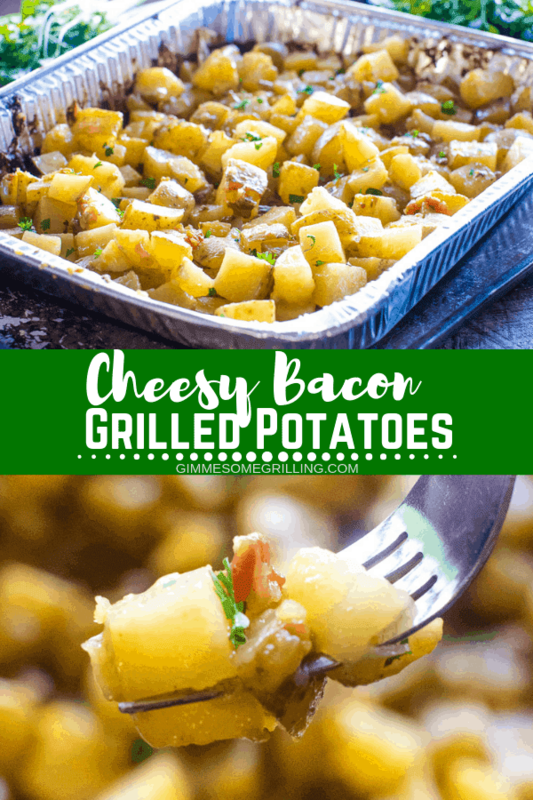 These Cheesy Potatoes on the Grill with Bacon are diced potatoes loaded with butter, onions, bacon and cheese grilled in a foil pan for quick and easy clean up! 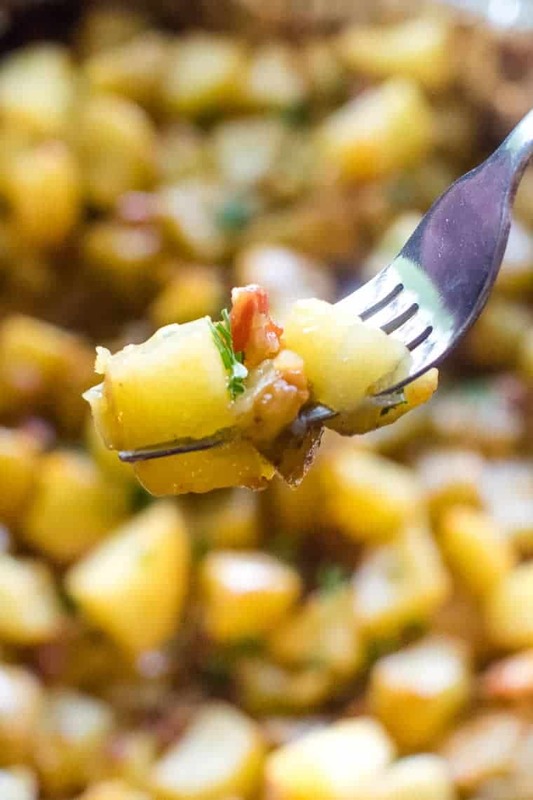 These grilled potatoes are the perfect side dish that everyone will love! 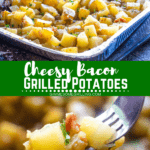 Who can say no to grilled cheesy potatoes and the bacon? Well that’s the icing on top! 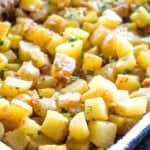 Diced potatoes loaded with butter onions and cheese these are like loaded baked potatoes, but even better! 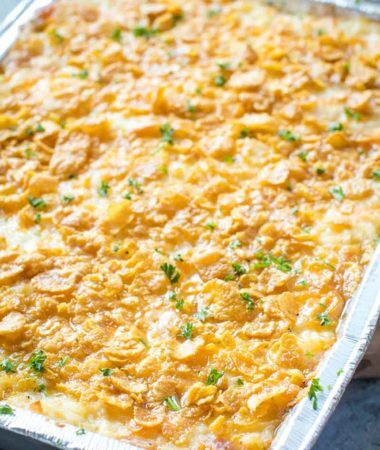 An easy side dish, think of this when there’s no room in the oven during busy holiday meals! These potatoes on the grill are one of our family favorites. My Mom requests them when we go to the cabin and my husband is happy to oblige her! Delicious and ridiculously easy pull the pan off the grill (or outa the oven) and regular potatoes? Never again, everyone is gonna want these taters! What’s not to love, right?!!! Grilling potatoes on the grill is a weekly rotation around this place. What are the best potatoes to grill? 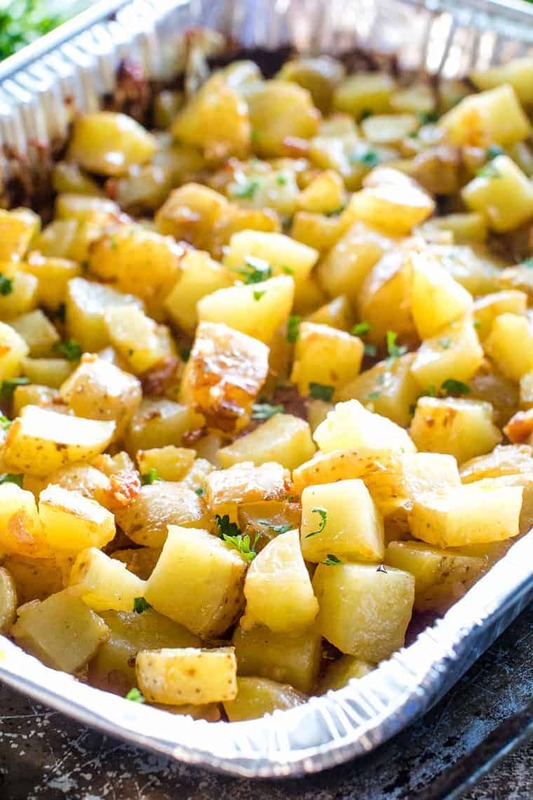 I love the creamy and fluffiness of Yukon Gold potatoes, fingerlings or red potatoes are also a great choice! Russet potatoes are super starchy and won’t be your best choice. Because of this they may end up soggy rather than tender. If all you have on hand are russet potatoes then I’m not going to tell you to rush to the store and buy something different, instead soak the potatoes in cold water for a couple of hours. Then dry the potatoes thoroughly. If they are not completely dry they will steam and may end up soggy. Our favorite main dish to pair with potatoes on the grill are these Asian Chicken Skewers, Beer Can Chicken, or my famous Sausage and Grilled Shrimp Kabobs! My mine is already asking for the latter of those choices next summer while we are at the cabin! 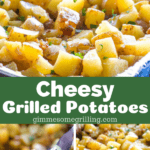 If you aren’t in the mood for these grilled potatoes another option is Grilled Baked Potatoes. So light and fluffy! These are AMAZING with my Smoked Prime Rib recipe! You know what else I love about these potatoes on the grill? They are made in a foil pan so I can literally toss everything together and then toss the pan right in the garbage. High five for easy clean up! What is the best way to dice potatoes? Start by scrubbing the potato well under warm water. Then after the potatoes are completely clean, cut a thick slice off one side of the potato. Flip it onto the cut side, this will give you a flat surface, next cut thick slices. Lay the slices flat on your cutting board slice them lengthwise into strips that are as wide as the slice is thick. Cut the slices into a dice. Cutting the potatoes into uniform pieces will ensure they all get done at the same time! 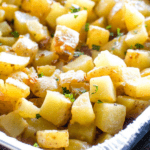 Do you need to boil potatoes before grilling? Not at all, that’s one of the reasons this is such a great side dish! How long does it take to cook Grilled Cheesy Potatoes? 30-40 minutes – cook until the potatoes are fork tender. Using the foil pan, combine all of the ingredients. 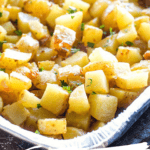 Place the foil pan on the grill and cook until the potatoes are fork tender. About 30-40 minutes. More potatoes great for grilling or on the smoker! Ok, here’s the recipe! Don’t forget if you make this be sure to tag me on Instagram!!! 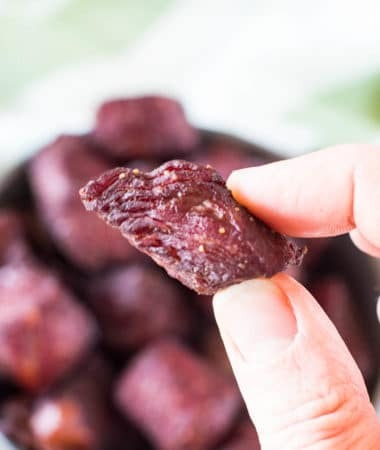 If you and your family love these recipes as much as I do, leave a five star rating below! Preheat grilled to 350 degrees. 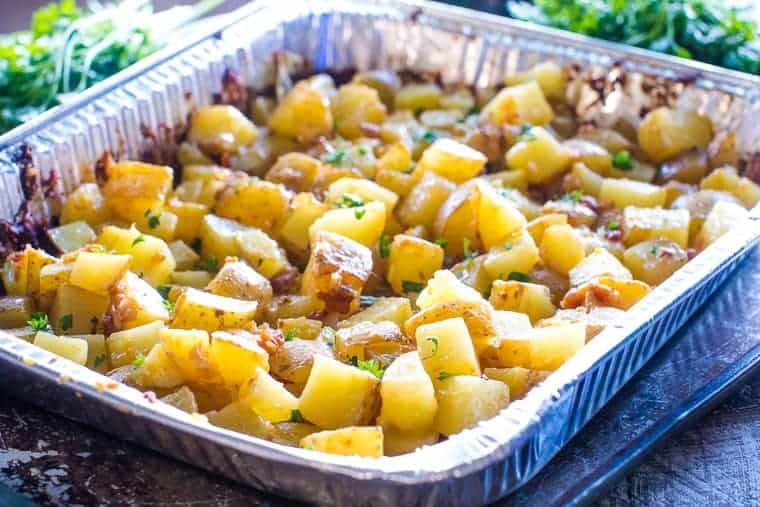 In a 9'' x 13'' foil pan combine the potatoes, seasoned salt, dried onions, bacon bits, cheese and butter. Stir to combine. Place on grill and grill for 30-40 minutes or until potatoes are tender. I love this idea! No boiling, and no cleanup! Plus, potatoes are my favorite. You’re making me want to cook EVERYTHING on a grill! It’s amazing that you can isn’t it?! 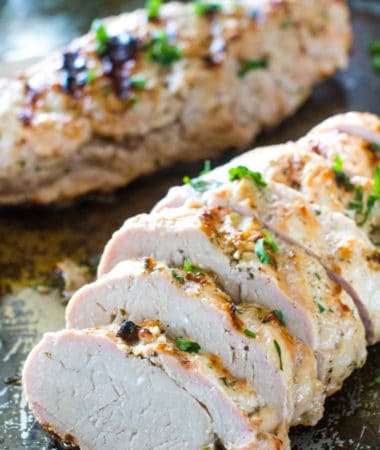 What a great side and to make it on the grill is a great idea – no muss, no fuss. I love no messes and easily clean up! 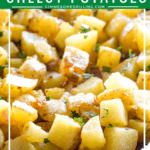 These are my go-to potatoes when I want a side dish that I know will please everyone! Great recipe!! It’s our go-to recipe too! Thanks! These potatoes are just amazing. So much flavor and so easy to make! They were perfect for a party over the weekend. And we are heading into Summer here in Australia so any excuse to use the grill is welcome. So glad you enjoyed them and anytime kids love new things is a win! I love potatoes on the grill!! Can’t wait to try your version!! I can’t either! They are a staple with any meal! I made these for breakfast this weekend and they were a huge hit – loved the combination!! Can’t go wrong with bacon and cheese!